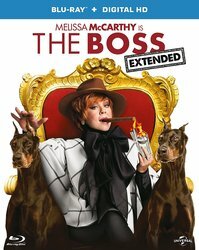 Academy Award®-nominated Melissa McCarthy (Bridesmaids, The Heat) takes charge in the outrageous, hilarious new comedy The Boss, out now on digital download, Blu-ray and DVD courtesy of Universal Pictures (UK). From the creators of Tammy comes the story of America’s richest woman having to fight her way back to the top after being sent to jail, by taking over a girl-scouts brownie business and showing everyone who’s the boss! Michelle Darnell (Melissa McCarthy) is a titan of industry who is sent to prison for insider trading. After doing her time, Michelle emerges, ready to rebrand herself as America’s latest sweetheart, but she soon finds out that not everyone she has steamrolled is so quick to forgive and forget. With nowhere to go and no one to scam, Michelle is forced to move in with former assistant Claire (Kristen Bell – Frozen, Forgetting Sarah Marshal) and her young daughter, Rachel. Now at her lowest point, Michelle wastes no time in devising a winner-takes-all plan to rebuild her empire. Can she reclaim her status as America’s most ruthless business woman, or will the love of one family take her down for good? McCarthy and Bell are joined by an all-star cast including Peter Dinklage (TV’s Game Of Thrones, Pixels), Kathy Bates (TV’s American Horror Story, Tammy) and Cecily Strong (TV’s Saturday Night Live). The Boss is guaranteed have fans in hysterics! To be in with a chance of winning one of 3 Blu-rays of The Boss, just answer the question below. The competition closes at 23.59 (GMT) on Monday 7th November 2016.